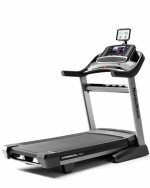 The New Balance 1400 treadmill is part of the next evolution in improving performance and achieving long life in home cardio equipment. The company has designed EZ CARE™ Maintenance, allowing treadmill owners to perform their own hassle-free belt adjustments, deck cleaning, and lubrication without placing a service call or reading over an owner’s manual. The New Balance 1400 treadmill has a bright, 8" x 10" brickyard display that monitors your time, speed, incline, distance, approximate calories burned, and pulse rate. Among its 10 programs, it includes eight Quick Touch present workouts, and two Quick Touch interactive programs. UPDATE: New Balance treadmills are no longer being produced or sold. Take a look at ProForm or NordicTrack for more features and value. New Balance has cut down on potential warranty service calls by designing their budget treadmills to have EZ Care™ Belt Adjustment. You can turn an adjustment knob to tighten the belt whenever you experience slippage. They even devised an EZ Care™ Port Access Maintenance system to make cleaning and lubrication of the deck simple enough for anyone to do. Along with using a mat under your treadmill, experts will tell you that you can extend the life of the treadmill by several years with such proper (and easy) maintenance. 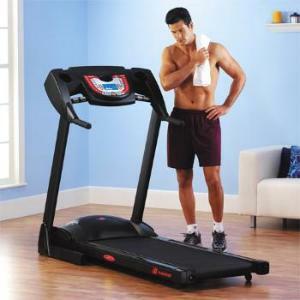 Treadmill reviews by customers cite features such as the nice “Flex Core” suspension system to reduce jarring impacts on knees, the Lift Assist for easy folding, and the Quick Touch™ Speed and Incline Keys that allow you to quickly jump to your desired speed or incline as reasons for their purchase. The New Balance 1400 also offers easy out-of-the-box assembly. As for negatives, the overly large console isn’t that attractive, and the treadmill won’t operate without the safety key inserted. Which means that if you should lose the safety key…well, you get the idea. The New Balance 1400 has a larger motor, a longer warranty, and a few more programs than its sibling, the 1200, which is priced at $899. This is definitely a better, stronger treadmill and is New Balance’s best model right now. For quality, however, it doesn’t match up head-to-head against the bestselling Sole F63, which is known for durability and is backed by a better warranty. But the New Balance 1400 treadmill is an all-around good machine, and offers excellent value priced at $999.